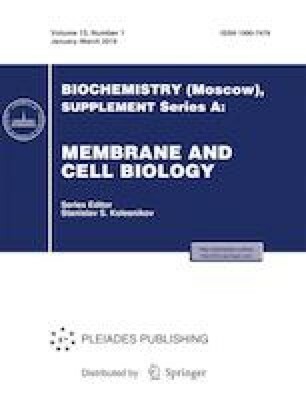 The effect of α,ω-hexadecanedioic acid (HDA) as an inducer of Ca2+-dependent permeability of the inner membrane (pore opening) of isolated rat liver mitochondria was studied in the absence and presence of pore blocker cyclosporin A (CsA) and one of its effective modulator – inorganic phosphate (Pi). It was shown that the addition of HDA at a concentration of 30 µM to Ca2+-loaded mitochondria induces swelling of the organelles, rapid Ca2+ release from the matrix, and almost total drop in Δψ, which indicates the induction of the Ca2+-dependent permeability of the inner membrane. It was found that 1 µM CsA or 1 mM Pi added separately do not affect these effects of HDA. At the same time, in the presence of both CsA and Pi, HDA added to Ca2+-loaded mitochondria does not induce their swelling, Ca2+ release from the matrix, and a drop in Δψ. It is found that unlike HDA, the induction of Ca2+-dependent lipid pore by palmitic acid is not blocked by the combined action of CsA and Pi. On the basis of the obtained data Pi is considered as a blocker of the HDA-induced Ca2+-dependent pore in the presence of CsA. In this case, Pi can not be replaced by a similar permeable anion vanadate. It was established that this effect of Pi was eliminated if mitochondria were incubated with SH-reagents mersalyl (10 nmol/mg protein) and n-ethylmaleimide (200 nmol/mg protein), which are known as Pi-carrier inhibitors. We conclude that the mechanisms of the effects of HDA and palmitic acid as inducers of the Ca2+-dependent permeability of liver mitochondria differ significantly. The Ca2+-dependent effect of HDA can be considered as the formation of a pore sensitive to the combined action of CsA and Pi, while the Ca2+-dependent effect of palmitic acid is the formation of a lipid pore. Possible causes of the blocking action of Pi on the HDA-induced Ca2+-dependent mitochondrial pore are discussed. This work was supported by the Ministry of Education and Science of the Russian Federation (project nos. 17.4999.2017/8.9 and 6.5170.2017/8.9), by the Russian Foundation for Basic Research and Moscow Region (project no. 17-44-500584), and by a grant from the Mari State University (project no. 2018-03b).